#NAVY the behind the scenes photos from #POUR #IT #UP #Video will be posted on my Instagram page! So please forgive the overload!! Rihanna like millions of today’s young women are utilizing the popular social media services to spread the good news about herself and her “God Given Gifts”, ex. Instagram, Twitter, Facebook, Tumblr, YouTube/Vevo, iTunes, etc. Rihanna, unlike millions of today’s young women is simultaneously looking to “turn a buck” from her efforts by always having valuable and in demand goods and services available for sale to go along with her out of this world, cutting edge, envelope pushing, online presentations. 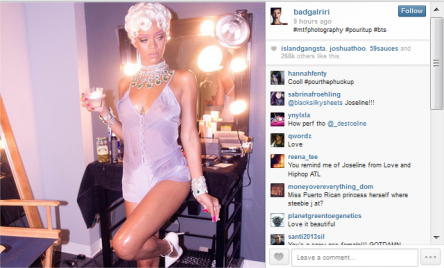 Dollar Power: As demonstrated by Rihanna on Instagram. Perhaps then, it can be concluded that the elusive state of profitability for an Internet service provider would come about by simply streamlining the services to be tailor fit for Queens as described in the second category and class of young women as listed above with Rihanna as a perfect example, to meet the growing demand for such said services that cover all bases both business and personal. A mind on the money perspective to consider. (Repost) A CELEBRITY – What Or Who Is It That Actually Turns A Person Into One? SECURE THE BAG – Gigi Hadid Is Ten Toes Down + Looking Like A Tall Bag Of Money!! !